Drive approximately 17 miles (27 kilometers) south of downtown Cairo and you’ll find yourself in Saqqara, the vast necropolis of the Ancient Egyptian capital of Memphis. Named for the Memphite god of the dead, Sokar, this is Egypt’s largest archaeological site. Its pyramids may not be as famous as the ones located in nearby Giza, but some of them (specifically the iconic Pyramid of Djoser) are considerably older. For those with an interest in archaeology, these trend-setting structures are amongst the country’s must-see ancient sights. The custom of burying pharaohs at Saqqara dates back thousands of years to the time of the First Dynasty, when kings ruled over a united Egypt for the first time. 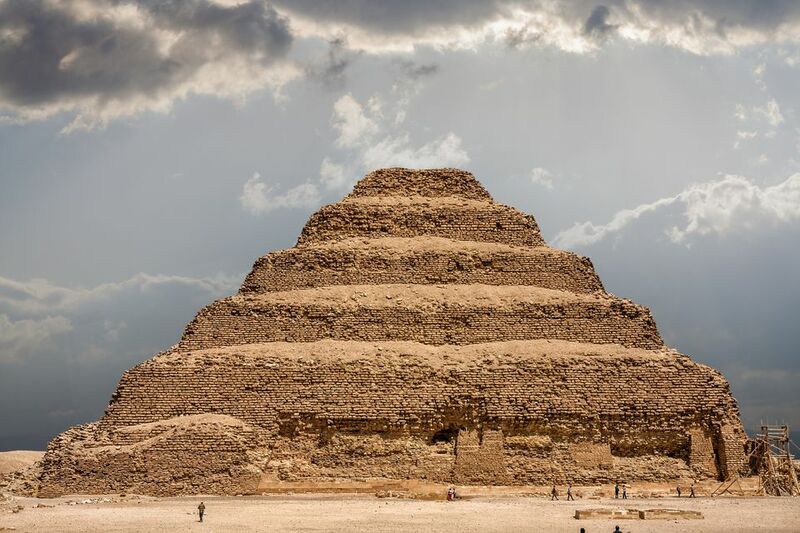 No fewer than 17 pharaohs are known to have chosen Saqqara as their final resting place and royals, their family members, sacred animals and important officials continued to be buried there for more than 3,000 years. Today, the Saqqara necropolis covers an area of 4 square miles (10 square kilometers). When the burial site fell out of use during the time of the Romans, it was gradually reclaimed by the desert. With the exception of the Pyramid of Djoser, the entire site was buried in sand by the time French Egyptologist Auguste Mariette uncovered the Serapeum in the mid-19th century. Since then, a constant process of excavation, recovery and restoration has been taking place at Saqqara. In 1979, it was inscribed as a UNESCO World Heritage Site along with the pyramid fields that run from Giza to Dhashur. The most recent discovery took place in July 2018, when archaeologists unearthed a mummification workshop complete with five mummies and their jeweled sarcophagi. The Pyramid of Djoser is without doubt the most famous landmark at Saqqara. Comprising six mastabas (flat-roofed tombs synonymous with the First and Second Dynasties) of decreasing size stacked one on top of the other, the pyramid has a unique stepped appearance. It dates back to the 27th century B.C. when it was built to serve as the burial complex of Third Dynasty pharaoh Djoser by his architect, Imhotep. The pyramid is the oldest known stone-cut monumental structure in the world, and Imhotep is credited with creating the blueprint upon which the later, smooth-sided pyramids were built. In its heyday, the pyramid would have stood 203 feet (62 meters) tall and its sandstone slopes would have been clad in polished white limestone. Today, entry into the pyramid is forbidden but the view from outside remains breathtakingly impressive. Many of Saqqara’s later pyramids were built during a time of economic hardship, and the inferior materials used have not withstood the test of time. Ten pyramids remain in addition to Djoser’s masterpiece, some of which are open for exploration. Of these, the most interesting is the Pyramid of Teti, a pharaoh of the Sixth Dynasty whose inscribed basalt sarcophagus still lies inside the burial chamber. Hieroglyphic spells from the Pyramid Texts adorn the interior walls. Saqqara is also home to an impressive array of tombs and mastabas in varying states of repair. The best include the Mastaba of Kagemni, Teti’s chief justice; and the Mastaba of Ti, the overseer of the pyramids at Abusir. The reliefs and friezes of the latter tomb have been painstakingly restored and are considered one of the finest existing examples of Old Kingdom art. They depict scenes of daily life in Ancient Egypt accompanied by hieroglyphic dialogue. The Serapeum, or underground burial chamber of the Apis bulls, is another highlight of the site. Kept and worshipped at the Temple of Ptah in Memphis during their lifetime, the sacred bulls were mummified after death and carried to the Serapeum to be buried in stone sarcophagi. This practice lasted for over 1,300 years, only ceasing in 30 B.C. To learn more about this and other rituals of the Old Kingdom, make sure to visit the Imhotep Museum, located at the entrance to Saqqara. Its five halls showcase some of the site’s most interesting finds, including the wooden coffin of Imhotep himself; the oldest complete royal mummy ever found and a recreation of the library of French architect Jean-Philippe Lauer. Lauer is famous for making excavating and restoring Saqqara’s treasures his life’s work. There are no public transport routes from Cairo to Saqqara, so unless you plan on hiring a car, a private taxi is your only option for exploring independently. If you don’t feel like haggling over prices with a driver on the street, ask your hotel to organize a taxi for you. Because the site is so vast, it’s worth hiring a driver for the whole day so that they can ferry you in between Saqqara’s most important sites. Many travel agencies, hotels and tour companies offer half or full-day tours to Saqqara. Although visiting with a group means that you have less freedom to explore at will, it can be a relief to have all costs included while the insight of a professional Egyptologist is invaluable. Many tours include visits to the nearby sites of Memphis and the Dahshur necropolis as well. Timing your trip carefully can make all the difference to your experience at Saqqara. The Egyptian workweek runs from Sunday to Thursday, and traffic getting in and out of Cairo can be stressful on these days. To avoid wasting time sitting in gridlock, try to plan your outing for Friday or Saturday instead. Similarly, the time of day is important, especially in summer. Plan to visit as early as possible so that you can avoid the midday heat. There is little shade and no refreshment available at the necropolis, so plan accordingly by bringing sunscreen, a hat, water and a picnic. Comfortable walking shoes and a flashlight for illuminating the tombs’ dim interiors are a good idea as well. Lastly, don’t forget that Saqqara is huge. Instead of trying to see everything in a single morning or afternoon, pick your must-see sights and focus on those.